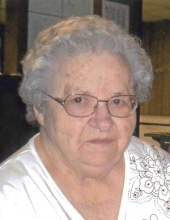 Lucille M. Kroll, 93, of Sterling died at the Johnson County Hospital in Tecumseh on Monday, April 8, 2019. She was born December 19, 1925 at Beatrice and graduated from Beatrice High School in 1942. She married Francis J. Kroll on July 25, 1950 at St. Joseph Catholic Church in Beatrice and moved to the St. Mary area where they farmed until moving into Sterling in 2004. She worked at Campbell Soup Company for 29 years. She was a member of St. Mary’s Catholic Church of St. Mary and the Altar Society. She helped with 4-H. She enjoyed embroidery, sewing, gardening, canning, puzzles, playing cards, tv game shows and attending local sporting events. She was an avid Husker fan and Royals fan. Survivors include one daughter, Janet (Dennis) Heusman of Sterling; four grandchildren, Brent (Addie) Heusman and Nathan Heusman both of Sterling, Megan (Brandon) Boldt and Abby Heusman all of Lincoln; six great-grandchildren, Marley, Mya and Merritt Boldt and Fletcher, Crew and Maddox Heusman; four sisters, Margaret Andersen of Beatrice, Dorothy Brown of Des Moines, IA , Evelyn Mitchell of Rockford, IL and Theresia Robertson of Lincoln; two brothers-in-law, Kenneth (Carolee) Kroll and Martin(Mary) Kroll; one sister-in-law, Marcella Weber; many nieces and nephews. She was preceded in death by her parents, Aloys (Louie) and Magdalen (Lena) Grell Meyer; her husband Francis Kroll, who died August 19, 2009; one brother, Robert Meyer; one sister, Virginia Neukirch. Mass of Christian Burial will be held at 10:30 A.M. on Saturday, April 13, 2019 at St. Mary’s Catholic Church of St. Mary with Father Craig Clinch, Celebrant. Burial will be in the St. Mary’s Catholic Cemetery of St. Mary. A Scriptural Rosary service will be held on Friday, April 12, 2019 at 7:30 P.M. at St. Mary’s Catholic Church. The body will lie in state at the Zink-Fox Funeral Home of Sterling from 4:00 to 8:00 P.M. Thursday, 8:00 A.M. to 4:00 P.M. Friday and at the church preceding the services. A memorial has been established to the family’s choice. To send flowers or a remembrance gift to the family of Lucille M. Kroll, please visit our Tribute Store. "Email Address" would like to share the life celebration of Lucille M. Kroll. Click on the "link" to go to share a favorite memory or leave a condolence message for the family.